Hidden in and around Minneapolis and St. Paul are some great roads, trails, and bike paths that are fun to explore. 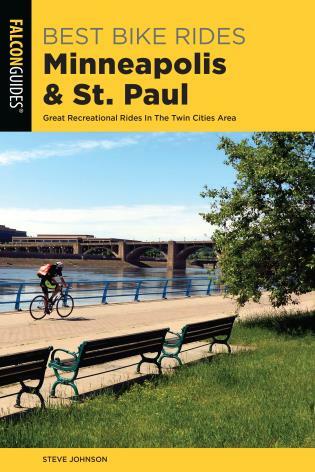 Best Bike Rides Minneapolis and St. Paul describes 40 great recreational rides in the metro areas. With most rides between 5 and 30 miles—including road rides, rail trails, bike paths, and mountain bike rides—it’s easy to find an interesting place to ride. Each route includes complete directions, a map, a text description of the area you’ll be riding, the GPS coordinates of the start/finish point, and color photos of one the ride’s features. Also included is information on local restaurants, lodging, maps, bicycle shops, other facilities for cyclists, and community resources. Steve Johnson is a self-propelled recreation junkie and fan of all things outdoors. A regular contributor to Backpacker and regional magazines across the country, some of Steve’s other work include Minnesota Waterfalls, Loop Hikes Colorado, and Bicycling Wisconsin. Steve lives in Kenyon, Minnesota.